Ford Motor Company and Ford Alghanim thank you for selecting one of our quality products. Our commitment to you and your vehicle begins with quality protection and service. At Ford Alghanim we are committed to investing as much care into servicing and repairing your vehicle as Ford does into building it. Our highly skilled Ford-trained technicians use Ford-specific tools and the latest computerized diagnostic equipment designed specifically for your Ford. We guarantee to use only genuine Ford spare parts, engineered to fit and perform perfectly with your vehicle. The new Ford Alghanim Service and Spare Parts Center is fitted with advanced equipment to ensure the completion of all maintenance services in an efficient manner from the first time, expertly performed by Ford-trained technicians for guaranteed quality and peace of mind. While cars are attended to and serviced, customers can sit back and enjoy a cup of coffee from the Costa Coffee on-site, or lounge comfortably and use the available amenities such as massage chairs, free Wi-Fi service and racing simulator. At Ford Alghanim, all services are performed using genuine Ford and Motorcraft spare parts to ensure the best operation of vehicles. . Your Warranty start date is the day you take delivery of your new vehicle. If you bought a previously owned vehicle, you are eligible for any remaining warranty coverage. When you’re behind the wheel of a new vehicle, the last thing you need is to worry. Every car purchased from Ford Alghanim comes with a 5-year / 100,000 km warranty (whichever comes first), allowing you to keep your mind on more important things, like where you’re driving to next. Additional or extended warranties are available on request; please contact us for more information and the latest promotions. i. Your Owner Guide indicates the scheduled maintenance required for your vehicle. Proper maintenance guards against major repair expenses resulting from neglect or inadequate maintenance and help increase the value you receive when you sell or trade your vehicle. ii. It is your responsibility to make sure that all of the scheduled maintenance is performed and that the materials used meet Ford engineering specifications. Failure to perform scheduled maintenance as specified in the Owner Guide will invalidate warranty coverage on parts affected by the lack of maintenance. iii. 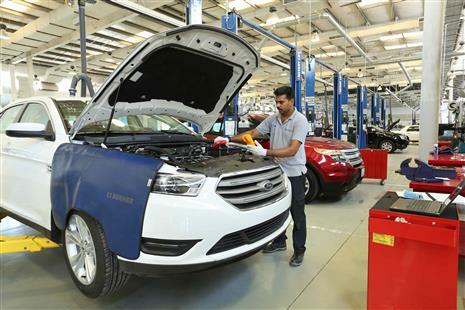 At Ford Alghanim, our Service Center has factory-trained technicians who can perform the required maintenance using genuine Ford parts. Ford Alghanim looks forward to meeting your every service need to maximize your satisfaction with your vehicle. The New Vehicle Limited Warranty does not cover: (1) parts and labor needed to maintain the vehicle; and (2) the replacement of parts due to normal wear and tear. As the owner, you are responsible for these items. Unexpected repairs can be costly – protect yourself, your vehicle and your budget. PremiumCARE – extended warranty coverage provided by Ford Motor Company and the only program backed by Ford. Enjoy your vehicle worry-free, long after your new vehicle limited warranty expires. Premium Maintenance Gives You Genuine Peace of Mind from Ford Motor Company. If you sell your vehicle before your Ford Protect Plan coverage expires, you can transfer any remaining coverage to the new owner. Whenever you sell your vehicle, prospective buyers may have a higher degree of confidence that vehicle was properly maintained with Ford Protect thereby improving resale value. Contact us today and find out how to register for peace of mind protection for your vehicle. Ford Road Assist provides complimentary roadside assistance to Ford retail customers. Fleet customers are not covered under the Ford Road Assist program. *applies to 2011 and newer model year vehicles. Assistance will be provided wherever services can be delivered by land vehicle on public roads, where access is possible and permissible by local law. However, the roadside assistance services will not be provided where or when weather, security or other circumstances make the provision of the services impossible or threaten the safety of the persons or equipment intended to provide the services. Desert and off -road recoveries as well as sand and mud extraction services are not covered under this program. Performance. Quality. Value. Just some of the reasons to choose Genuine Ford Parts. So don’t take chances. Insist on the parts manufactured with over 100 years of experience. Insist on Genuine Ford Parts. Ford Motor Company has two major brands of parts. Both choices are right. Genuine Ford parts are original equipment service parts available only through Ford Dealers. You’ll hear these referred to as “blue box” parts. Motorcraft parts, or “red box” parts, are either original equipment or built to Ford’s specifications. Want only the best Genuine Ford or Motorcraft parts? Then come visit the Quick Parts counter at the Ford Alghanim Service & Spare Parts Center, where we carry a full array of parts to get you up and running, well, quickly. If you need Customer Assistance, our Customer Relationship Center is available to assist you with all your automotive needs.